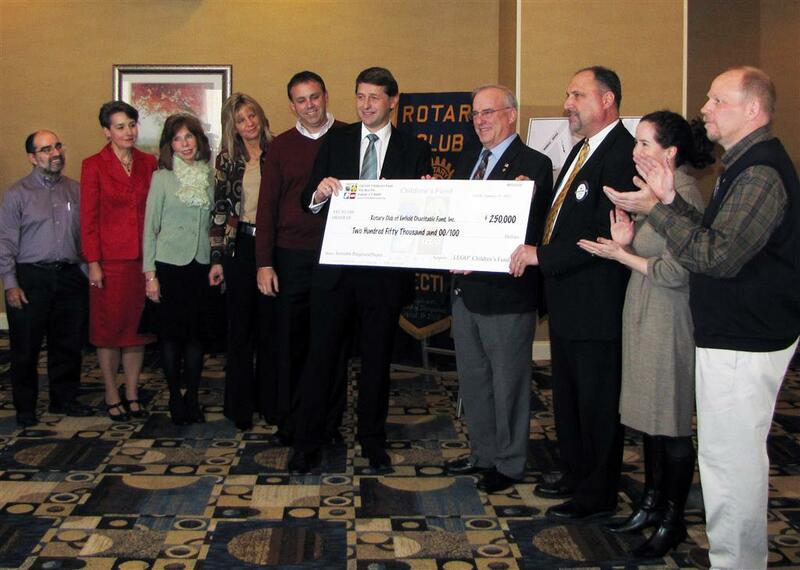 During its first year of existence, the club helped Rotary International grow by organizing and sponsoring the Windsor Locks club. In 1947, the Rockville club was sponsored. Again in 1964, Enfield served as organizer and sponsor of a new club in neighboring Somers. When the Town of Enfield celebrated its 250th anniversary in 1933, Rotarians were involved in planning events and ushering at the anniversary concert. In the club’s early years, the Rotary Christmas Carol Sing was a source of great pride and was eagerly anticipated. It filled the Enfield High School auditorium to capacity for nearly 20 years. When Little League Baseball was in its infancy, the Thompsonville Little League was among the earliest formed in Connecticut. Not only did two local Rotarians have a hand in forming the organization in the early 1950s, but another Rotarian also donated a playing field. The club sponsored a team in the league from the very beginning. In 1956, the club began awarding scholarships to college students from Enfield. Rotarians raised $600 annually and awarded two $300 scholarships to juniors and seniors in college. The Rotary Club formalized the scholarship awards process and incorporated the Enfield Rotary Memorial Scholarship Foundation in 1982. (Please visit the Downloads page, which can be found in the menu on the left side of the Home Page, for a photo and the names of the latest recipents.) In the decades since its inception, the Scholarship Foundation has awarded more than $300,000 to students from Enfield. The club changed its name to “Rotary Club of Enfield” in the 1960s to better identify with the town as a whole. On June 13, 1965, the Rotary Eternal Light for Peace was dedicated in front of Enfield Town Hall and still shines to this day. Enfield Rotarians participated in a World Community Service project with a club in Larnaca, Cyprus in 1979. Over the course of two years, more than five tons of school books were collected, inspected, packed and shipped to Cyprus for use by refugee children. The club raised nearly $4,000 to cover shipping costs for what was the largest club project to date. Rotarians started a "Career Shadowing Program" for juniors attending both of Enfield's high schools in 1981. In 1982, the club began supporting the Enfield Police Department's annual "Toy For Joy" program. Since 1985, the Enfield Rotary Club has raised tens of thousands of dollars for Rotary International's “Polio Plus” campaign to help eradicate polio from the face of the earth. When we started raising money for Polio Plus, there were 125 countries with reported cases. Today, bolstered by billions of dollars of support from the Bill & Melinda Gates Foundation since 2007, Rotary’s war on polio has seen the incidence of polio reduced to three countries: Pakistan; Afghanistan; and Nigeria. Between 1993 and 2000, the club held an annual "Lobsterfest" as its major fund-raiser. Attracting nearly 500 people, it was held at the Four Town Fairgrounds in Somers. Also in 1993, the club began sponsoring an annual "Enfield Rotary Classic" high school girls basketball tournament between Christmas and New Year's Day. Proceeds from this event support girls sports programs at both Enfield and Enrico Fermi High Schools. In 1996-97, Enfield Rotarians collected and shipped $100,000-worth of medical equipment-including a complete X-Ray room, a complete Dental Examination room and two dozen computers-to a remote village in Poland with the assistance of Connecticut businessman David Chase. In 2000, the Enfield and Rockville Rotary Clubs joined forces to sponsor an annual golf tournament. This partnership resulted in major fund-raising successes for both clubs. The two clubs opted to host separate tournaments in 2005. 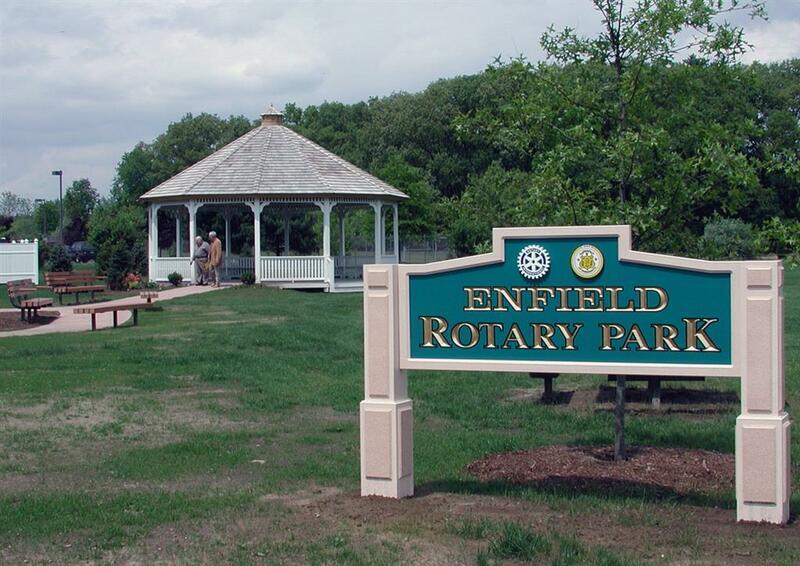 The Enfield Rotary Club began its largest community service project in 2001. During a two-year period, the Club raised more than $48,000 to provide a gazebo, outdoor benches, tables, trees, shrubs, and plantings for the Enfield Senior Center. The Senior Center opened in June 2003. 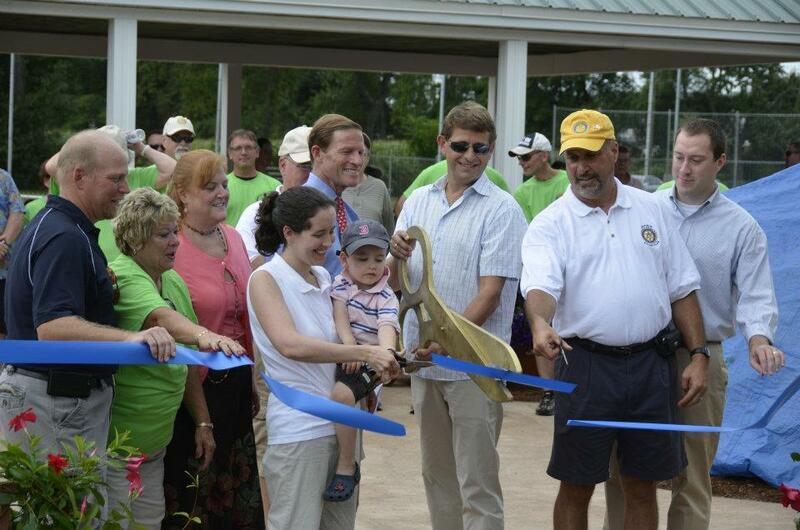 The dedication of “Enfield Rotary Park” that year was the highlight of our club's 75th Anniversary celebration. Also in 2003, Connecticut Governor M. Jodi Rell named the Enfield Rotary Club one of the State's “Treasures” for its ongoing service to local and worldwide communities. Beginning in 2004, the club began supporting the Shamlaji Hospital in India after one of our members returned from a trip with photos of a poorly equipped and undersupplied makeshift clinic. With the help of 12 other Rotary Clubs in District 7890, $3,000 was raised for an International Service Project that supported basic medical services for mothers and children, eye clinics and distribution of medicine and drugs to neighboring villages. 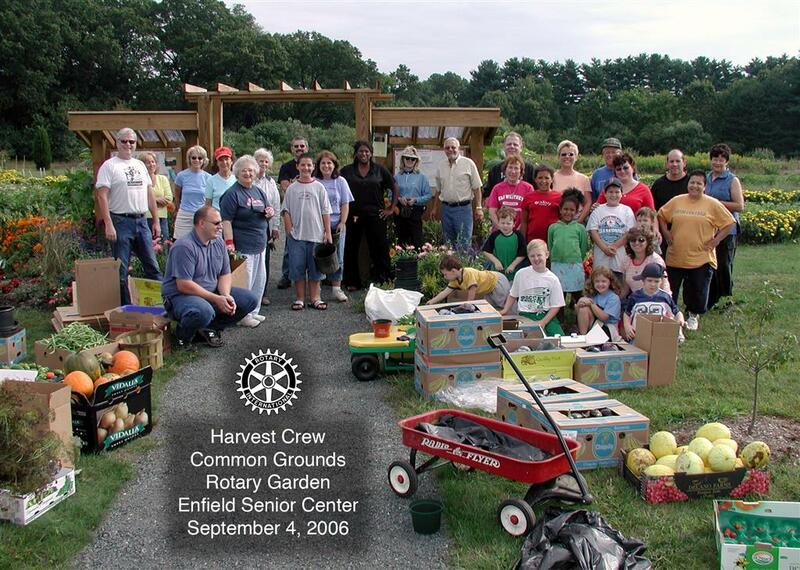 With an eye toward helping a pair of community support agencies - the Enfield Food Shelf and the Loaves and Fishes Soup Kitchen - Rotarians returned to the Enfield Senior Center in April 2006 with shovels, hoes, rototillers and a bobcat tractor. The goal was to establish a large vegetable garden on one-third of an acre behind the Rotary Gazebo. Under the guidance of UCONN Master Gardener and Enfield resident Amalita Grimes, thousands of plants and flowers were planted by Rotarians and community volunteers over the course of several weeks. Local businesses and organizations donated thousands of dollars worth of plants and materials and the Enfield Rotary Club pledged $10,000 to create the garden. Eight weeks after the garden was established, some 170 heads of lettuce were donated to the Food Shelf. Donations at the end of the first season and every year since then have been measured in tons! After the first couple of years of operation, the “Common Grounds Rotary Garden” was turned over to a group of community volunteers. A Rotaract Club was established in 2009 at Bay Path University by Professor and Enfield Rotarian (and past President) Cheryl Leary. In 2010, the club embarked on a multi-year effort to raise money for an accessible playground in Enfield, available to children of all physical abilities. The idea for the project was introduced by Club President Lindsey Weber. 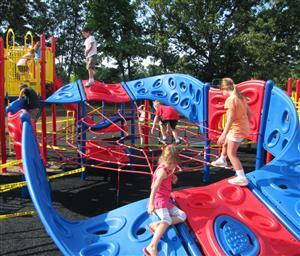 An Accessible Playground Committee was formed, headed by Rotarian Ed Palomba. The club originally envisioned a 3-5-year fundraising effort because of the cost of purchasing and installing accessible playground equipment. Raising money for and completing one module at a time was discussed as an option. But near the end of 2011, the LEGO Children's Fund came forward with a $250,000 grant, enabling the club to fast-track the playground project. A site behind the Public Library on Middle Road was approved by the Town Council. Construction started in spring 2012 and a ribbon-cutting ceremony was held on July 28. 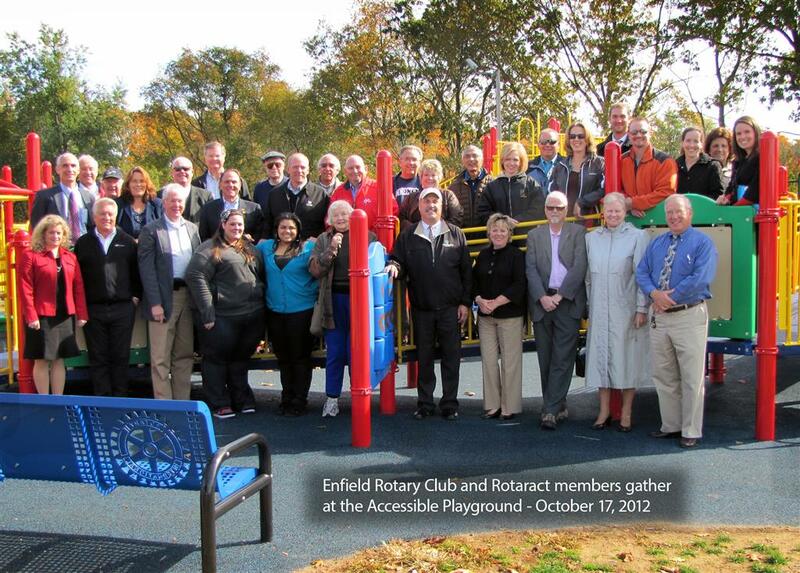 The Enfield Rotary Club raised an additional $90,000 for the playground project that added a pavilion with picnic tables, donor signs, assorted benches and a bit of landscaping. 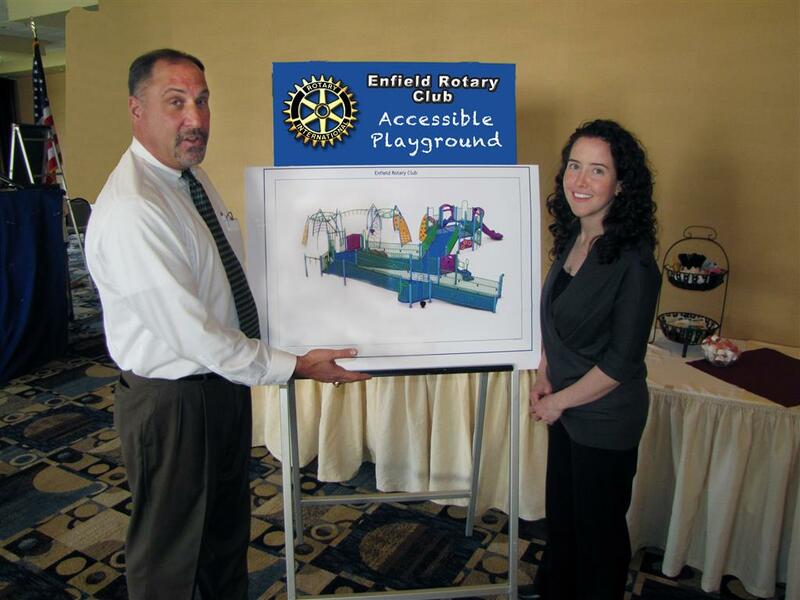 The Enfield Rotary Accessible Playground has become one of the favorite family destinations in Enfield and is a testament to the club's commitment to community service. In 2012 we also established the Cinco K Mayo 5K Charity Run/Walk as our major annual fundraising event. Approximately 200 runners and walkers participate every year. In addition, numerous corporate and individual sponsors add their support, which enables our club to award scholarships, support local organizations and pursue major service projects. In 2015, our club added a third-of-a-mile walking path around the Library grounds to provide a family friendly exercise element to the Accessible Playground. We’re currently considering plans to add an outdoor reading and performing amphitheater. In addition to its major projects, the Rotary Club of Enfield continues to support a wide variety of local clubs and organizations, such as the Enfield Food Shelf, Loaves & Fishes Soup Kitchen, the Network Against Domestic Abuse, a Town Literacy project that provides dictionaries to grammar school children, the American Cancer Society’s Relay for Life program, Enfield Police Explorers, Enfield Little League and softball teams, Educational Resources for Children, Allied’s Attic Thrift Store, High School Safe Graduation Parties and many more. We also support service projects sponsored by other Rotary Clubs. For example, Rotarians in Manchester and Somers have been promoting clean-water initiatives in Central America and Mexico for many years. Our club, as well as individual members, gladly contribute toward improving the health and lives of families living in underdeveloped areas of the world. The Be Like Brit Orphanage in Haiti has also received our club’s support. Not only have we collected money and supplies for the orphanage, but we have also supported students and faculty from Asnuntuck Community College who have travelled to Haiti for hands-on service projects. The Enfield Rotary Club will continue to support community activities and pursue service projects that benefit people around the world. Please let us know if you would like to join us on our mission of "Service Above Self." Thank you.